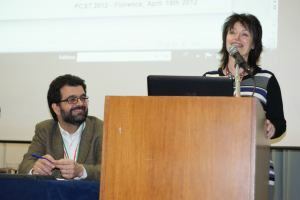 I had the pleasure to meet Anne Glover, who had just been named Chief Scientific Adviser to the President of the European Commission, while I was working on a panel I had submitted to the 2012 International Conference of the Public Communication of Science and Technology (PCST) Network in Florence. I invited her to join us in my panel – along with Fiona Fox, Morten Busch and Charlotte Wien – to discuss about the experience of the International Network of Science Media Centres I had started working with since the Doha 2011 World Conference of Science Journalists, and she happily accepted the invitation: her speech was both interesting and entertaining (the audio of that panel is available on the page of the Science Media Centre Global Network, in the right column). Since then, I met Anne Glover on several occasions, and I always had the perception of a great person who has been doing a great job to help inform the European policy makers, and citizens, about the science – the evidence – available on all controversial topics. And when several NGos (including Greenpeace) started a campaign against Anne Glover and the function of the Chief Scientific Adviser to the President of the European Commission, I contributed to write with the colleagues of the European Federation for Science Journalism an open letter to the new President of the European Commission, Jean-Claude Juncker, to defend her and especially the role. Unfortunately, a few weeks later Juncker decided to kill the post.